Today we have a guest video game review from Max @ Impassionedcinema! 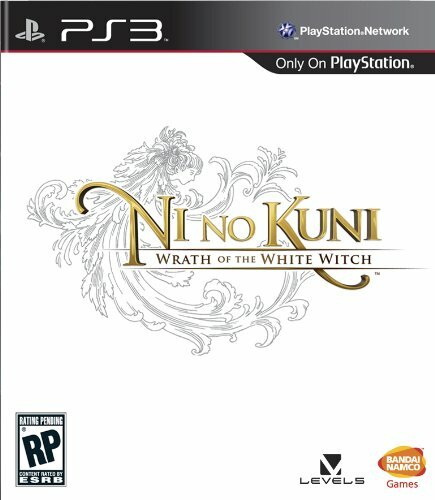 An English translation for the highly anticipated Level-5 and Studio Ghibli collaboration, Ni No Kuni: Wrath of the White Witch, has been a long time coming. What more could gamers of JRPGs ask for? Level-5, best known for their work on Professor Layton and Dark Cloud, has been a long-time fan favorite in Japan. While famed anime studio, Studio Ghibli, has been known for their outstanding animated films, taking audiences to worlds we’ve never seen before. On paper it sounds as though failure is not an option. In the end though, how did it hold up? Ni No Kuni follows the story of a boy named Oliver. Oliver lives with his mom in the quant town of Motorville, where you guessed it, the residents are obsessed with motor vehicles. One fine day, Oliver is asked to sneak out of his house late at night in order to try his friend’s new car that he built. Catastrophe occurs and Oliver’s mother suffers heart complications while trying to save Oliver from an accident. Depressed over the loss of his mother, Oliver locks himself away until he is summoned by his doll, Drippy, to save an alternate world. Saving this parallel universe might allow Oliver to save his mother. 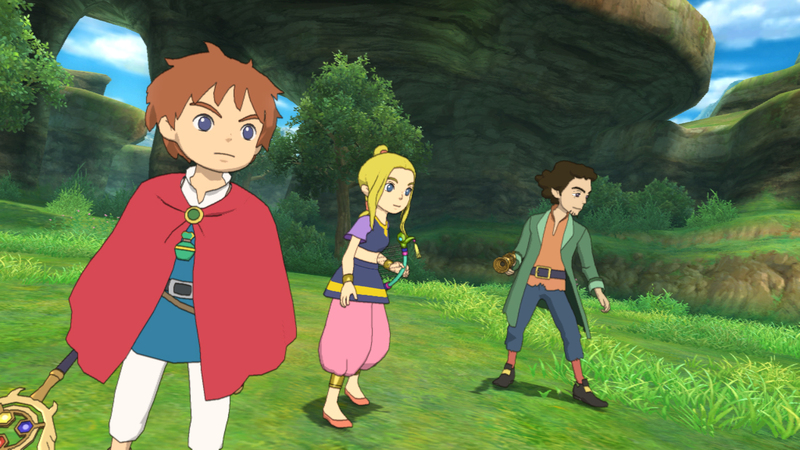 There’s enough story in Ni No Kuni to fill a novel, but how does it play? Level-5 has imagined the gameplay of Ni No Kuni to be a hybrid of Pokémon and the Tales Of… series of games. Oliver and his companions control familiars in combat that share the same health bar, but have different attributes in attack, defense, magic, etc. Battles are initiated by running into the world map avatar of the enemy and conducted in real-time. Collecting familiars is still as rewarding as it was in Pokémon all those years ago, but the payoff and percentage of captures are poorly balanced. Most players will be satisfied leveling and grinding their starter familiars till the end game. Most of the world map battles can be summarized as repeatedly tapping the attack prompt to overpower your enemies. If you aren’t powerful enough yet, expect to spend at least an hour grinding up your familiars. Casting spells is also troublesome. If your character is waiting to cast a spell, but another familiar on the battlefield casts before, get ready to enter the queue again. This is especially troublesome in the late game when trying to craft items by stealing from enemies. Most of the time they will be dead before you can even cast the spell. The other problem is that tougher battles will likely be determined by how fast you can block as opposed to anything else. Most of the villains will have tell-signs before they summon a deadly spell and with those five seconds canceling an attack and setting up a block can be the deciding factor. Blocking has always been an underutilized aspect of JRPGs, but with battles playing out in real-time, it’s a race to set up the block. About twenty hours into the game, your companions are given the ability to set up their block by pressing a button on the controller. This is right after one the most difficult battles in the game. Why couldn’t Level-5 given you that ability far earlier? Up until this point, there’s been a lot of focus on the chunky battle system. Rightfully so though, because when the playtime of Ni No Kuni will likely exceed 60 hours, it should be fair and enjoyable. Luckily, the overall presentation should be enough to guide players to the end. 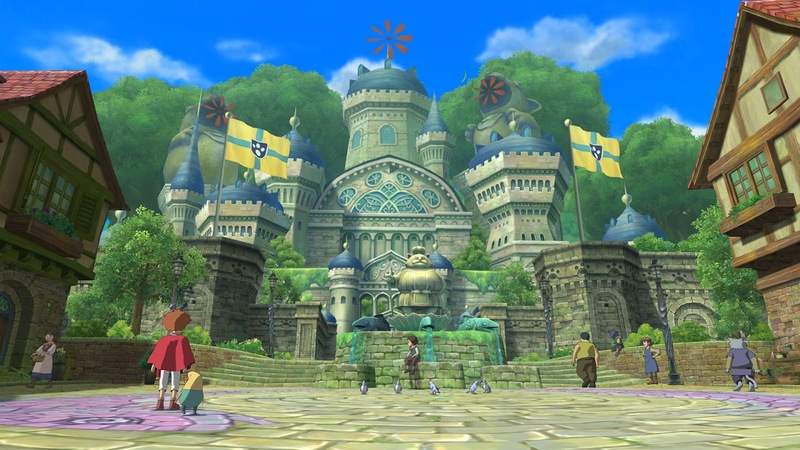 Ni No Kuni is simply one of the best looking JRPGs ever created. While actual anime sequences become few and far between after the beginning of the quest, the character design and worlds exemplify the artwork from Studio Ghibli. It’s almost as if Oliver is another hero in the long legacy of Ghibli greats and the story could easily fit into the overall catalog of great films. The score of the game is composed by Studio Ghibli veteran Joe Hisaishi. While Ni No Kuni suffers from having only one piece of music for battle sequences like most JRPGs, it’s always exciting to visit a new town to see the spectacular art design and music come together. Although the battle system leaves a lot to be desired, Ni No Kuni was the first JRPG I’ve completed this generation of consoles. Whether it was the hope that there would be a satisfying ending (there wasn’t) or seeing what Studio Ghibli had concocted for the next villain or town, Ni No Kuni held my interest to the end. When a game is entertaining enough that the final quest gets put off until the last possible moment, it has done something right. While Ni No Kuni isn’t the masterpiece Western gamers were waiting for, it is the masterpiece they needed. It has proven that JRPGs that don’t bear the name Final Fantasy or Dragon Quest can still be successful outside of Japan. Even more incredible Ni No Kuni is a console-exclusive to PS3. For an exclusive title to sell as well as it has is an incredible achievement. If you can look pass the mechanic problems of the battle system, Ni No Kuni is a recommended play-through for all RPG fans. I have been wanting to play the game for a while, unfortunately I do not own a PS3 at the moment (would’ve been nice if they actually released it to XBox 360 as well). The odds of a 360 release are slim to none, Japanese audience don’t care about the Xbox platform, and this was primarily aimed at the Japanese market. It was even released on the 3DS in Japan. Great review Max. I’ve considered picking up a copy of this game but your review leaves me pondering whether I should do it or not. I’m also starting to feel as if I’m not as passionate about JRPGs as I used to be. The artistry of the environments do pull me in though. I’ll let you know if I end up caving. Niels, I have felt the same way about JRPGs lately. I often lose interest after ten hours or so. I’m slowly playing through two right now, though — Final Fantasy IX and Persona 4 Golden. Loving both, even though it was probably a terrible idea for me to start them at the same time. Totally agree that the battle system left something to be desired, but after just beating this myself, I can only echo the sentiment that this was far and away one of the best JRPG’s I’ve played in ages. Really wish more video games would pay as much attention to story and character as this does. Damn, really sounds like I’m missing out on this one. I’m trying to cool it on buying new games for a while, but you guys are making it hard to pass this one up.